The Cone Nebula is an HII emission nebula approximately 2,700 light-years distant in the constellation of Monoceros. It was first observed by William Herschel on 26 December 1785. 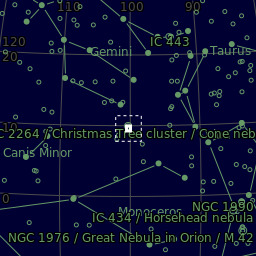 Perhaps that is one reason that the associated star cluster (the nebulosity and the cluster are both designated NGC 2264) is referred to as the Christmas Tree Cluster. Just above and to the left of the blue reflection nebula is an area knows as the Fox Fur. This was photographed between 31 December 2018 and 8 January 2019 from a remote imaging rig in Spain, jointly owned and operated by Barry Wilson and me. A total of 27 hours and 40 minutes.